Tapping threads using a secondary application adds unnecessary time, handling and labor cost. Tapping tools allow you to tap holes right in the punch press with unparalleled speed and accuracy. With tooling options for numerous machine styles and various thread sizes available, these tools are a clear way to increase productivity and lower cost of goods. Tapping tools are available for Thick Turret, TRUMPF, Strippit PX and Euromac style machines. Tapping tools create threads in pre-tapped holes much faster than secondary operations. Watch in-machine tapping tools at work below. QuickTap™ tapping tools save you the time and accuracy that’s lost with a secondary threading application. 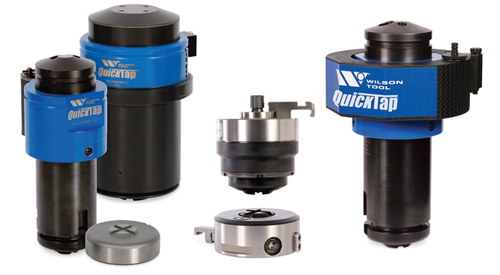 QuickTap tools are the fastest and most reliable tapping tools on the market. Available for Thick Turret, Strippit PX and Euromac machines, the tools not only tap up to 200 holes per minute, but they are made and serviced by Wilson Tool. QuickTap comes with all the components needed to get you tapping holes in no time, and Wilson Tool provides all the replacement parts necessary to keep your tool tapping for years to come. The tapping tool TRUMPF-style eliminates costly and inaccurate secondary operations by allowing you to add threads to holes right in the TRUMPF-style punch press. Able to tap holes at any programmed location on the sheet, this tapping tool creates stronger threads because it forms rather than cuts them, and also eliminates the problem of shavings often caused by machined tapping. Take a look at this example cost comparison chart to see how much money you can save by hole tapping in your punch press vs. manually. There’s no denying the facts – a QuickTap™ or TRUMPF-style tapping tool will pay for itself. Speed isn’t the only priority – accuracy matters, too. That’s why Racine Metal-Fab switched from manual tapping to automated tapping with the QuickTap™ tool for Thick Turret. The solution saved them time and prevented waste due to inaccuracies. Tapping tools provide top-quality service, speed and delivery. 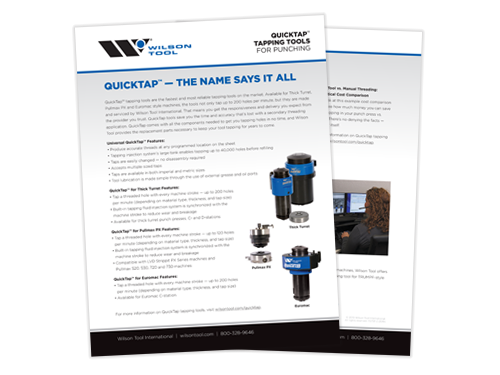 Get a printable QuickTap™ flyer for Thick Turret, Strippit PX and Euromac machine products or the TRUMPF-style flyer. Both flyers explore the features and benefits of tapping tools. Read this article from the Tooling Times e-Newsletter to explore the various ways of making threads and the solution that might be right for you.